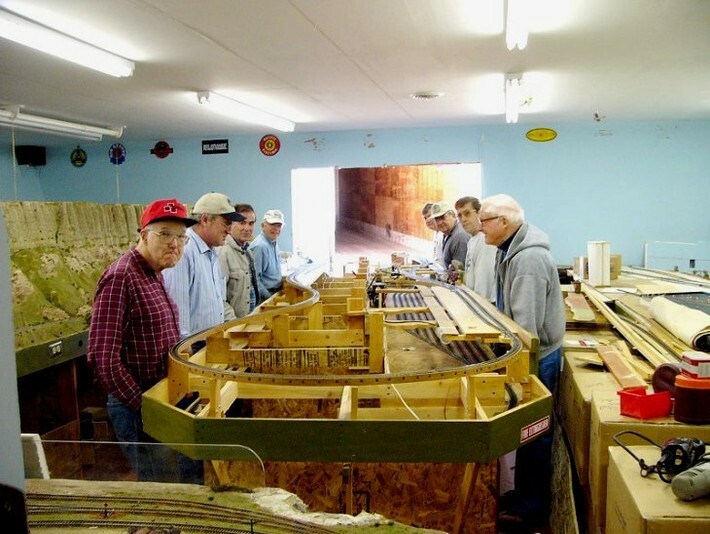 This layout is owned and operated by the Great Falls Model Railroad Club. Construction of the layout was started in 1965, and portions of the original layout are still in use. Although progress is slow on a project of this size, we try to have a new feature completed for each year's Montana State Fair. Future improvements will include a new master control console, more scale structures, and additional landscape features. This is a permanent display which we work on and operate year around - it is not moved or disassembled after the Fair. Our club is allowed use of the Club Room in return for running this free exhibit for Fair visitors for the full duration of each Montana State Fair. 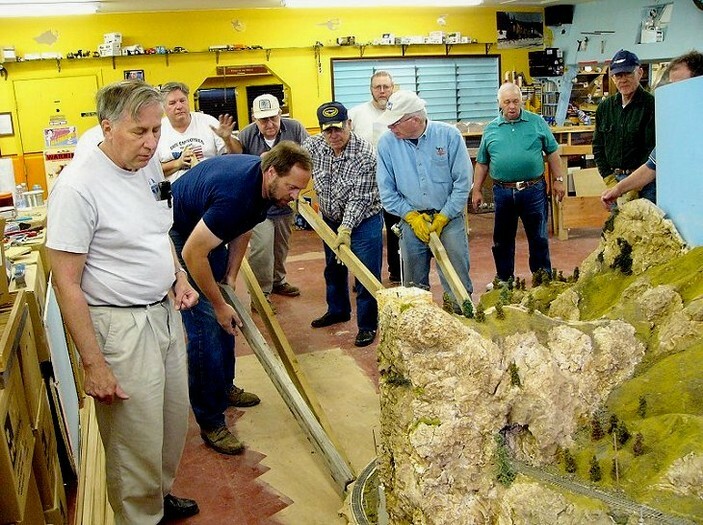 This railroad layout is the largest club layout in Montana. The South table measures approximately 12 feet by 72 feet long. The full mainline run from Great Falls to Butte is 380 feet long (over 6 scale miles). All the track and switches were laid and spiked down by hand. The trains can be controlled from the tower which has 5 control panels or from the 7 remote control panels located around the layout. We have used over 3,200 feet of rail, 85,000 wood crossties, 160 electrical blocks, 140 turnouts, and thousands of feet of electrical wire. The North, or Ellis layout is even larger, about 35 ft. by 70 ft., and is not connected to the S layout yet, but as they are back to back, will likely be done soon. This layout is about 80% completed (as if a layout is ever done). At present, it has about 2200 ft. of track, 150 turnouts, and 3 turntables. Following is the North layout. Click on a part of the image to enlarge. 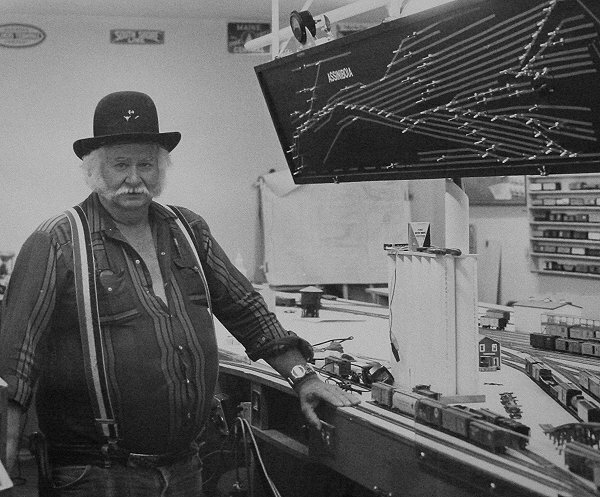 The North layout was willed to the museum by Pete Ellis of Cascase Montana. It was his pride and joy, housed in two relatively small rooms, with isles so narrow that visitors trying to meet were guaranteed some intimacy. 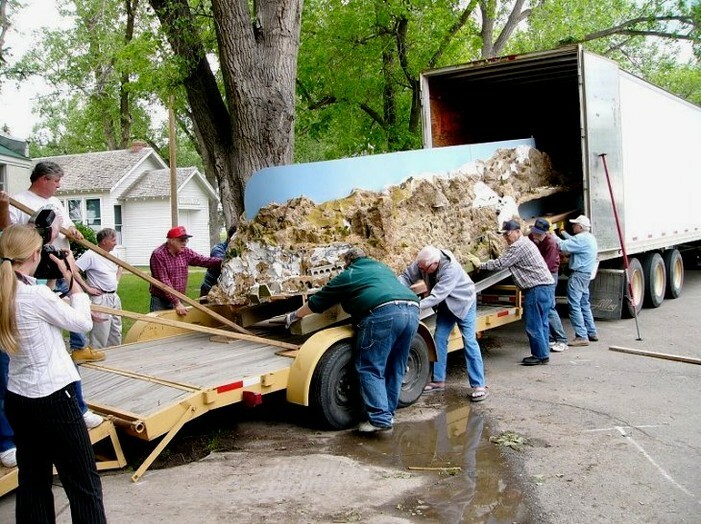 After months of preparation, his work of 50 years was moved through a large hole sawed in the end of his building. 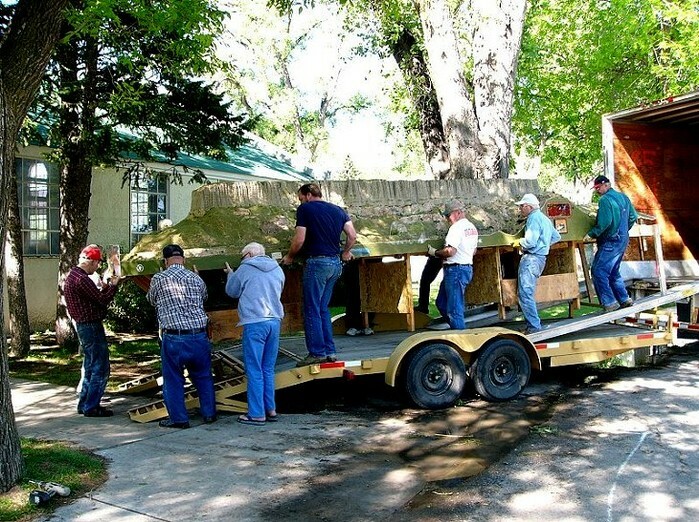 In 4 trips, his entire layout was moved in an extra long semi trailor to its new home at the museum. To adjust the isles for handicaped access, some redesign of the layout was made, but it still remains as a breathtaking event for those first seeing his amazing lifetime of work. Pete was famous for his modeling skills, a member of the NMRA Master Builders Award. He also served as consultant to the the Disney people. His model train layout is the star attraction of the railroad museum. Below, at Pete's barn, the guys have sawed a hole in the end of the building, the semi is backed up agaqinst it, and the guys are about to move one of the lighter pieces. This section was a different story !